I have been putting off doing some stuff that I will take with me to some upcoming events I have been lucky enough to guest speak at. The first one is the Ontario User Group Meeting in Guelph on the 15th. So in preparation for this event, I am going to give a tutorial on making a model in Aspire. This should keep my skills sharpened as well! 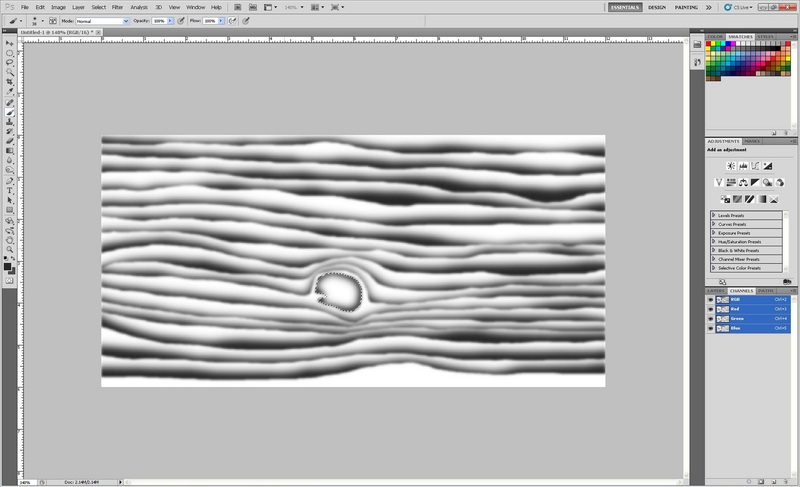 In this next run of tuts, I am going to cover creating textures from scratch, as well as distorting them and applying them to our model. Once we build the model, It can be saved for future projects, but any skills that are acquired in the process can be used on a daily basis with Aspire. Our project this time is going to be a grouping of 3 cartoon wooden pylons with rope tying them together. The first step in the process is to create our cartoon wood texture. 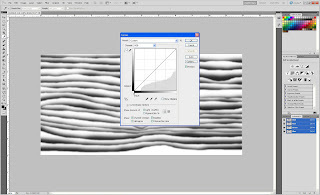 I could have found a nice woodgrain image online, but the pickings were slim for cartoon life! I used Photo shop for this part. If you don't have PS, there are other free programs that can be used to create what we need. GIMP is the first one to come to mind. 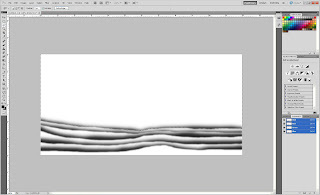 I start by opening a new 12" wide by 6" high file in PS. I set the DPI to 72 to keep it light on resources. I also opened it as a greyscale image as Aspire converts all the images to this when making a component anyways. Next I took the lasso tool, and with 'anti-alias' checkbox checked, and the feather set to 2px, I started at the bottom left area and drew a smoothish wavy line across the page, then up to the top right, then top left, and then released the mouse button. 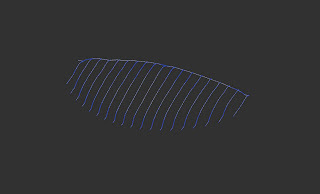 The lasso tool will connect the start and finish of it's path with a straight line, closing the loop. 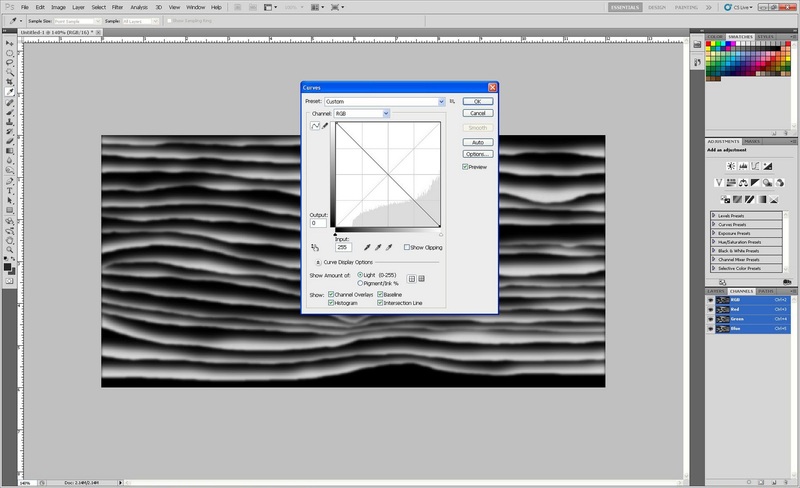 It should look like the image above when you are done. I then chose the brush tool, set the size to 41, the hardness to 0, and the opacity and flow set to 100%. I didn't use straight black, but just under halfway to white is a good start. 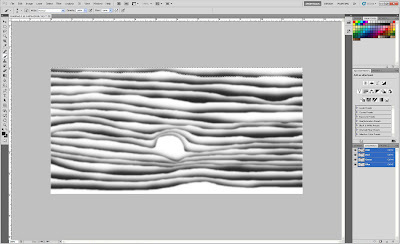 Now draw the brush across the wavy selection, making sure that the brush stays approximately down the middle of the selection outline. 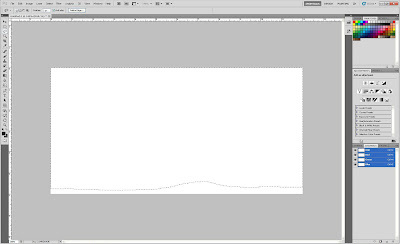 This will let the brush stroke fade to white on the top, but be cut off hard at the bottom by the selection outline. If you click any of the images, you will get a much larger/ clearer view of it. Now we do the very same steps over again, just above the first one. Feel free to vary from what I've done, you may like your results better! And over, and over again. You will notice that I am starting to squish the grain together in the middle, this is where we will draw a knot later. 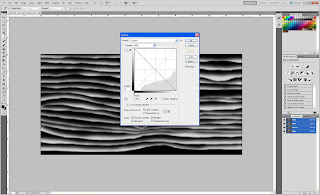 Spend some time having a look at woodgrain images online, just to get a feel for how they work. 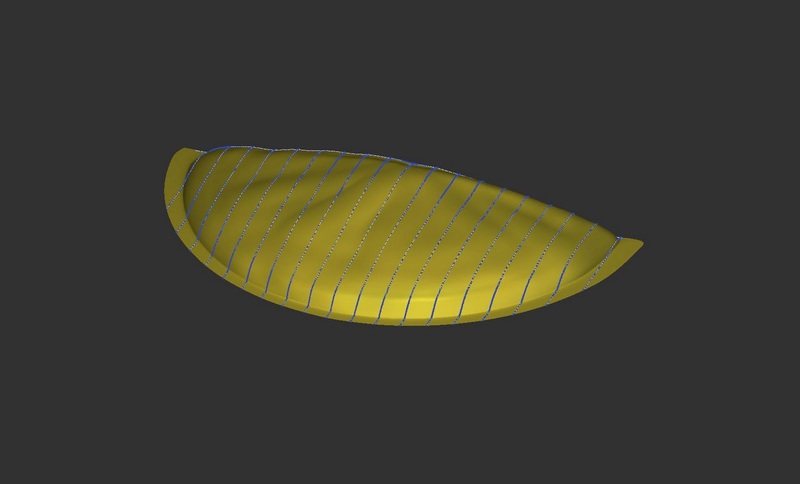 I have continued to progress along with the grain, leaving the 'hole' for my knot. The knot was first drawn with the lasso tool, then with the same brush settings, I just kissed the edge, slightly darkening the outside of the selection. 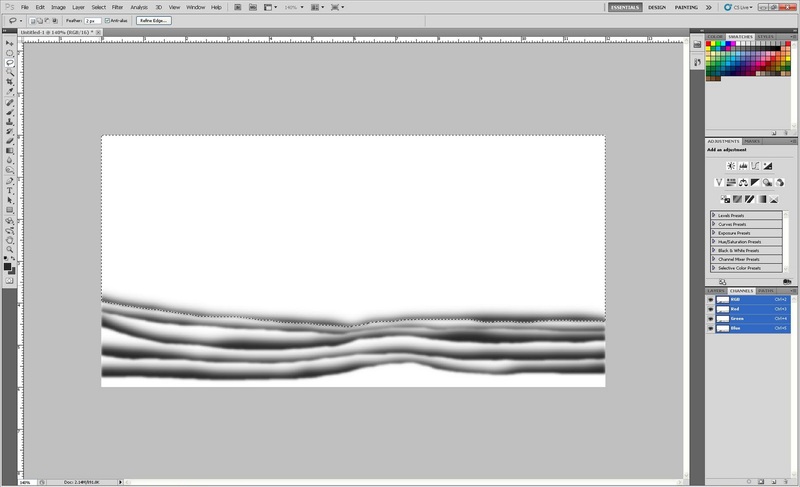 Now just draw a smaller lasso selection inside that and use the brush tool the same way again.. 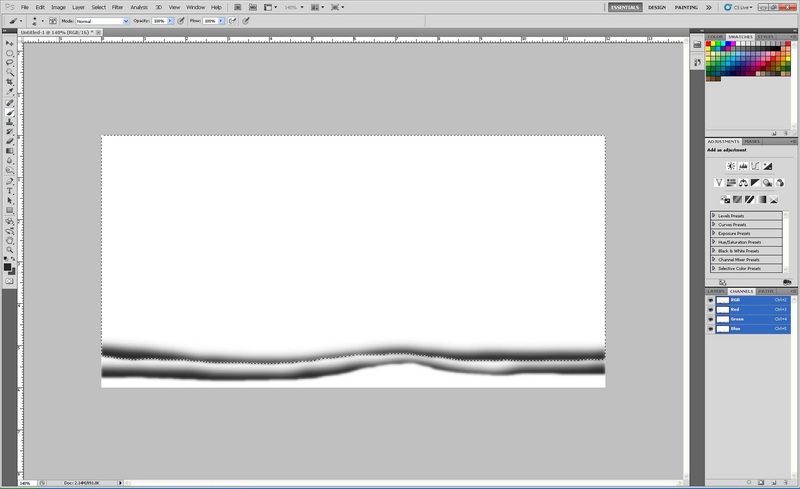 Finally, I switched the brush down to a size 4-7, and drew the little splits in the knot. 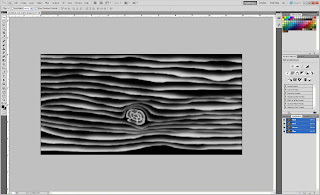 Now when Aspire converts an image to a relief, it basically interprets the dark values as being lower in height than the lighter values. True black being the lowest, and true white being the highest. I could have just drawn the image with a light brush on a black backgound, but I have a better feel for drawing the way we did. So instead, I just open the "IMAGE-ADJUSTMENTS-CURVES" dropdown menu and reverse the light and dark values as in the image above. 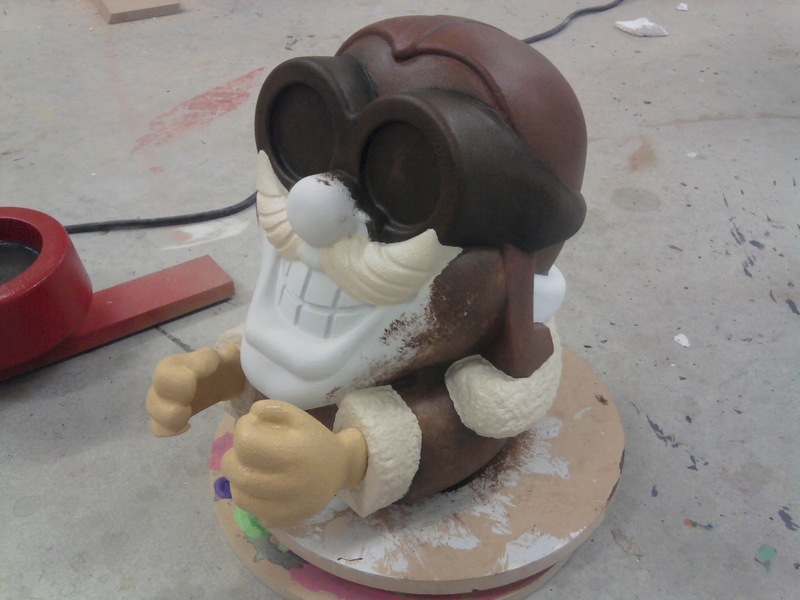 Here is the final 'Toon-Grain' ready to save and import into Aspire. Tomorrow I will cover the importing and converting our drawing to a relief, as well as drawing our 3D pylons and rope model. I love this stuff!!! I slept in a hair today, and didn't make it to the shop until 9 am, which now that the money job is done, was no big deal. The first thing was starting to get the chrome on the money. 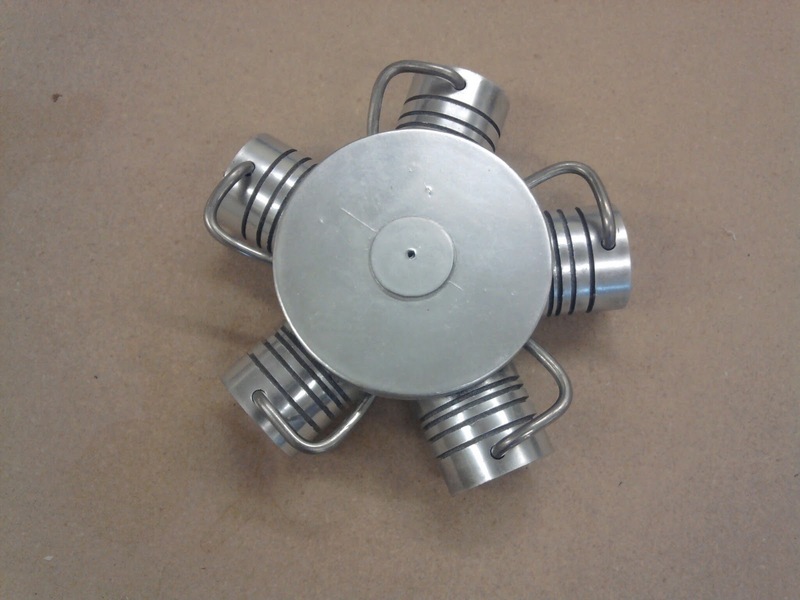 We use Alsa Chrome for shiny metal. It is as shiny as it gets from a paint. However, it is only as good as the gloss level of the black base-coat. 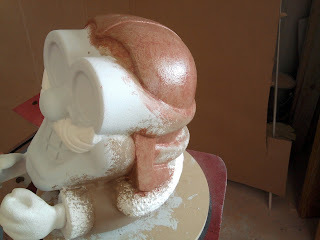 As with our buffed metal powder we use, if it's applied over satin, the metal is satin, over gloss it becomes chrome. You spray it on very, very lightly. An 8 oz bottle could probably chrome a car! Which is good because 8 oz is probably the same cost as one! It took a couple of hours to lightly spray the chrome, working in very small tight circles. I actually had to switch it up with Jody a few times as my arm was starting to kill me. Once the chrome was done, we moved on to picking out the dollar coins with a brush and some gold-ish paint. A couple more coats on the dollar coins and then it's done! This was a pretty sweet job, all said and done. Two awesome gigs in a row. We had a pre-pro meeting last week for a Davinci inspired flying contraption. That should be another amazing job for us. Why work when you can do this! This morning I got the legs and wire lathe on the mound form. 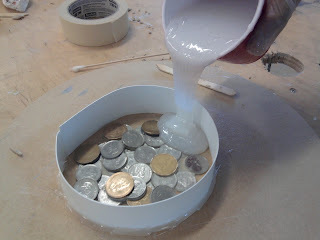 (If Rob from Indiana saw this, he'd want to cover it in concrete :) We waited on casting the coin sheets as they are very flexible when the resin kicks off. 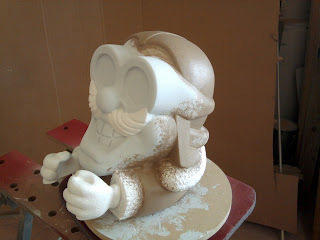 This way we could pull them from the mold and bend them over the form. They are very soft at this stage as well, and this allowed us to brad nail them to the ribs on the form. At this point, the only thing to do was cast a sheet and nail it down. 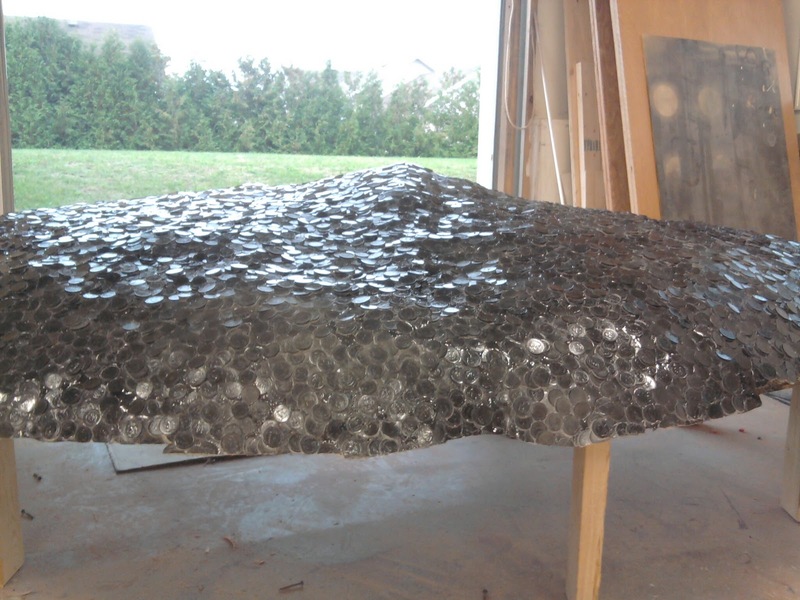 It takes about 12 minutes to mix/pour and demold a finished part. Now due to other things going on, we weren't as fast as that, but we were close. They have already shot the fountain this will be sitting in, so the front edge doesn't need to be very clean, we just left an overhang so they can crop it where they need. They will be pouring water all over this, and as we overlapped the seams away from camera, this meant that it would shed water like a backwards shingle. 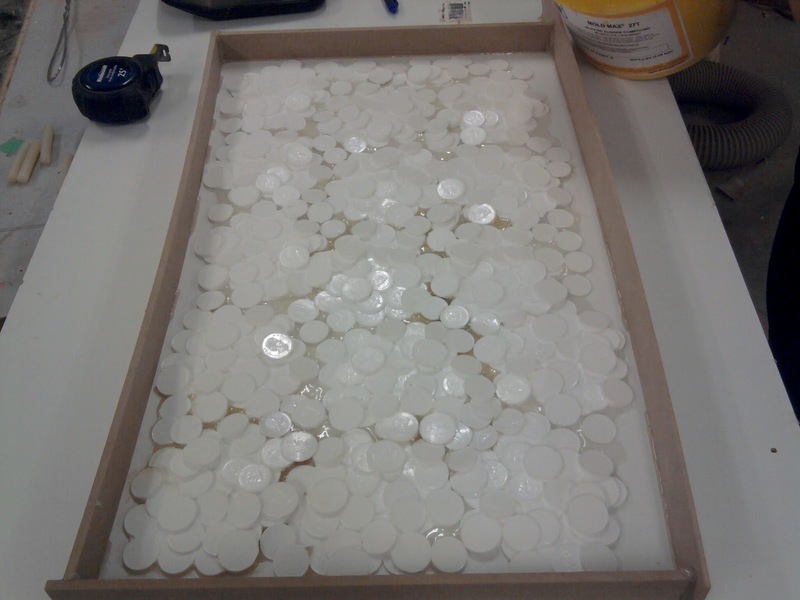 So we filled the back seams with a urethane adhesive, both a glue and water resistant. Then it was a few coats of gloss black for this huge pile. 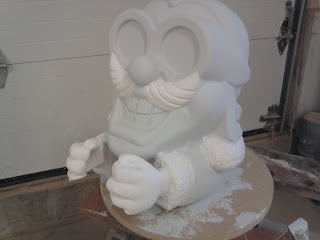 I will leave this to dry overnight, and in the morning we will spray it with Alsa Chrome. This is as chrome as you can get from a paint. It goes on supper light, and takes the same reflective characteristics as the gloss coat under it. 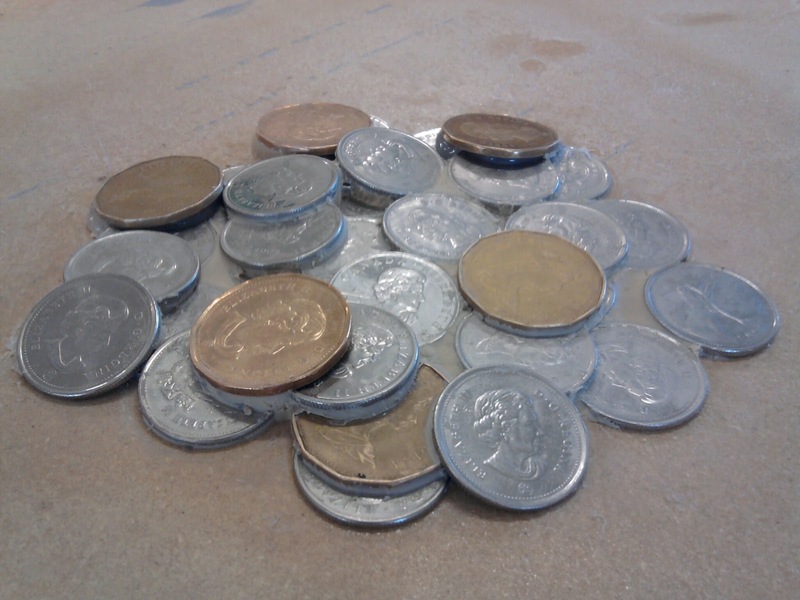 Should look pretty sweet once we individually pick out and paint the gold tone coins. No copper though, to bad, copper is my favourite colour! 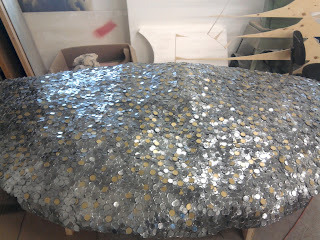 On Sunday, we de-molded the small pile of change we made on Saturday. It came out really good actually. 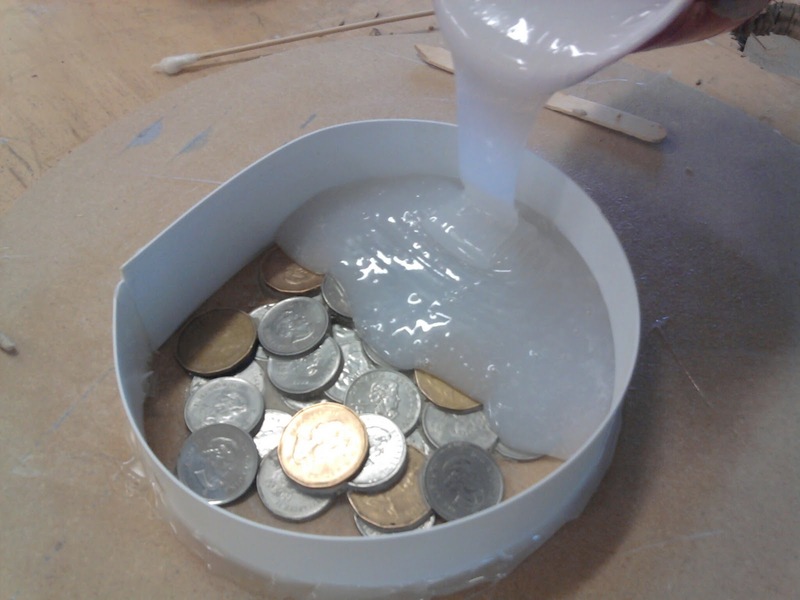 Because the coins were hot glued together, and the undercuts were filled with clay, I was to scared to move the mold to the vacuum chamber for de-gassing in fear I might open up a seam in the original and have coins get trapped in the liquid rubber. So we just left it on its own to de-gas. I was anticipating a few air bubbles around some of the edges, but there were none. Everyone gets lucky sometimes! After that Jody moved onto casting 15 piles of coins from this mold. 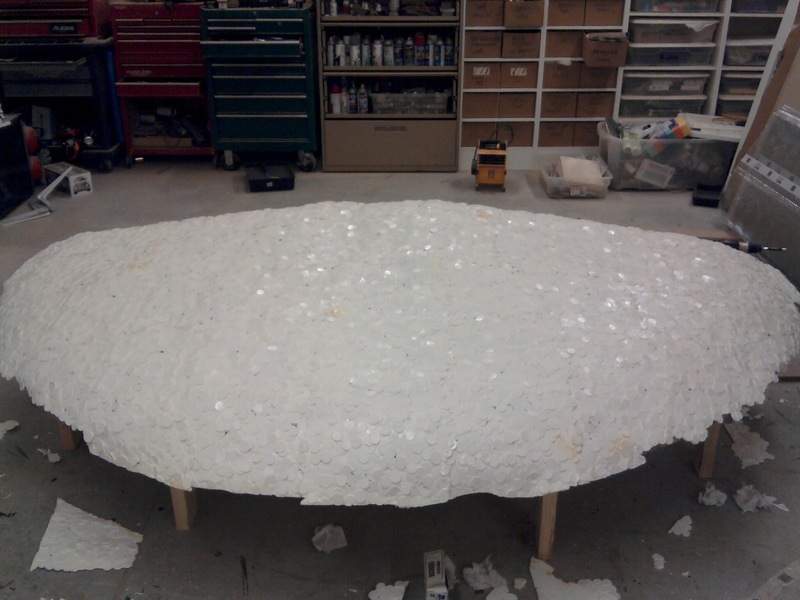 The next step was to lay all 15 piles out, glue them to a backer board and fill all those new undercuts so the new rubber wouldn't creep where I didn't want it. We were able to de-mold this new rubber today at around noon. 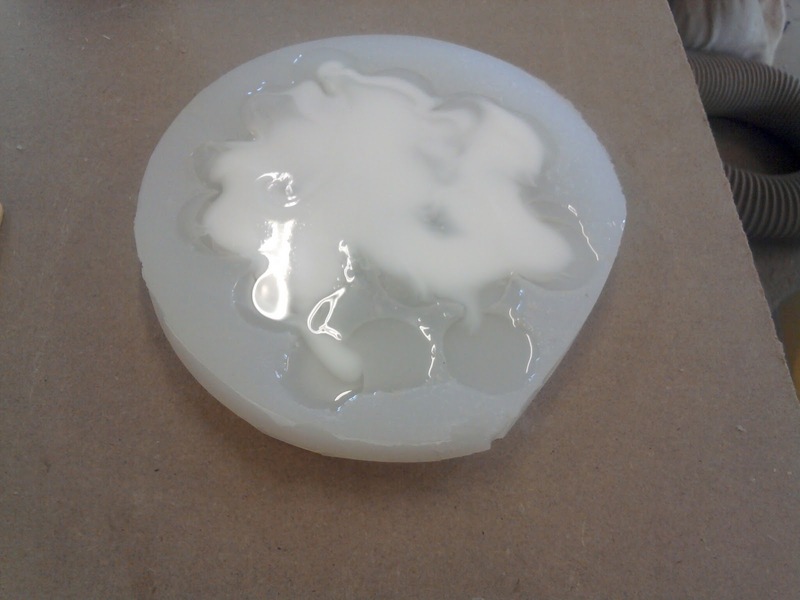 I could tell it should have been left a bit longer as it didn't want to release all that easily, but I needed a volume measurement to see how much resin we actually needed as opposed to what the math led us to believe. I was pretty close at 5.5 cups, but the actual volume was 5. This means we would order a 5 gallon kit, which is actually 5 gallons of part A, and 5 gallons of part B, for a total of 10 gallons. And a little left over. It's handy stuff to have around. 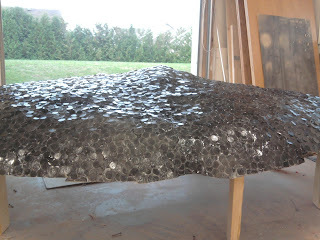 So with Jody out picking the resin up, I had to pickup the materials for the coin mound structure. I was able to break down some of the parts in Aspire for a better sheet yield, so I got all the parts onto 2 sheets of 5/8" plywood. 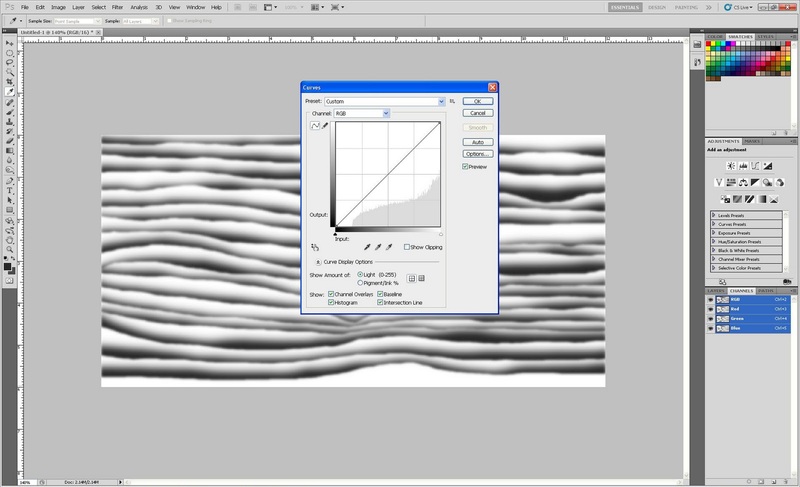 When I first got notified about this job, I modeled a quick computer render of what the piles dimensions would be. After I had the final model sizes in the computer, I spent Sunday evening sculpting the computer model into a more shapely lump. Once I was happy with the lump, I added a flange to the base for when I slice it, this will give me a flat plane on which to lie everything in the computer. 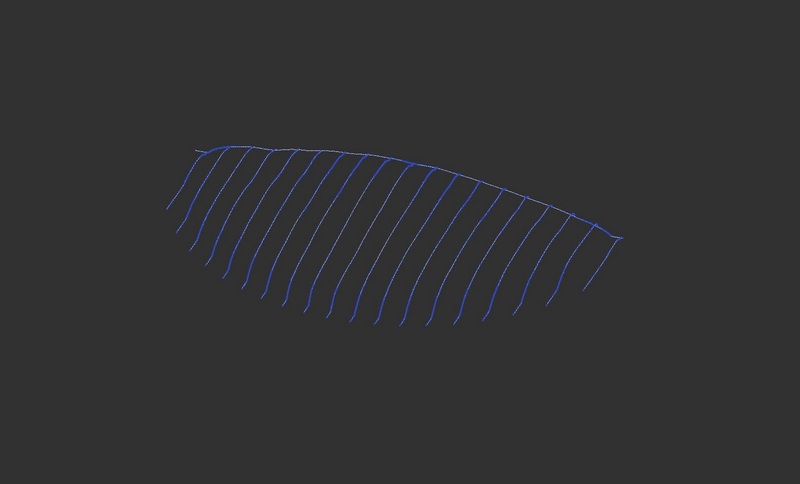 Next I sliced the file into polylines which will become the ouline shapes of the ribs I will cut on our Techno cnc. 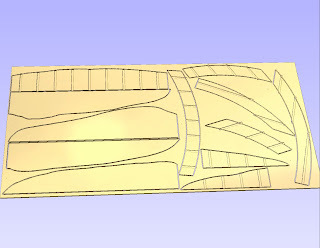 Once the ribs and back of the model were generated, I exported these as DXF's into Aspire, and added a few lines to make the final ribs for cutting. I also laid out a half circle arc for the front of the lump, and cut in pockets so the ribs would slot into the half circle ring and the back. 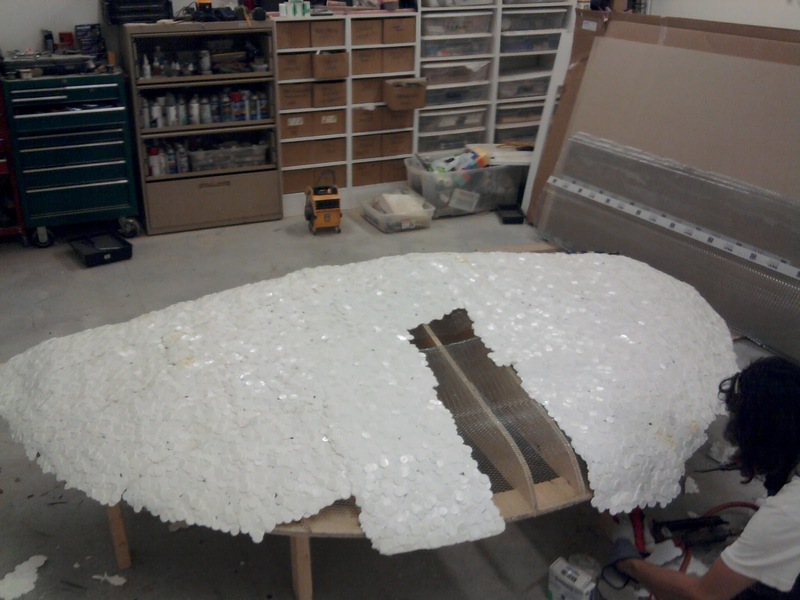 It took about 40 minutes to cut both sheets up, and about 40 minutes to assemble it all. First thing tomorrow I will cover this lump in wire lathe, and we can start to get the coin sheets attached. I am really hoping by the end of day the whole mound will be silver. Lets keep our fingers crossed! On a quick note, each small pile contained $15.25 worth of coins. 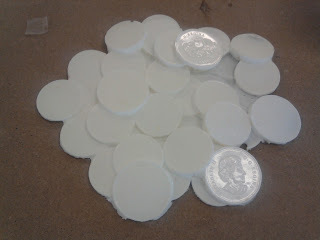 Each large sheet was made from 15 small piles plus an additional $4 in filler coins. 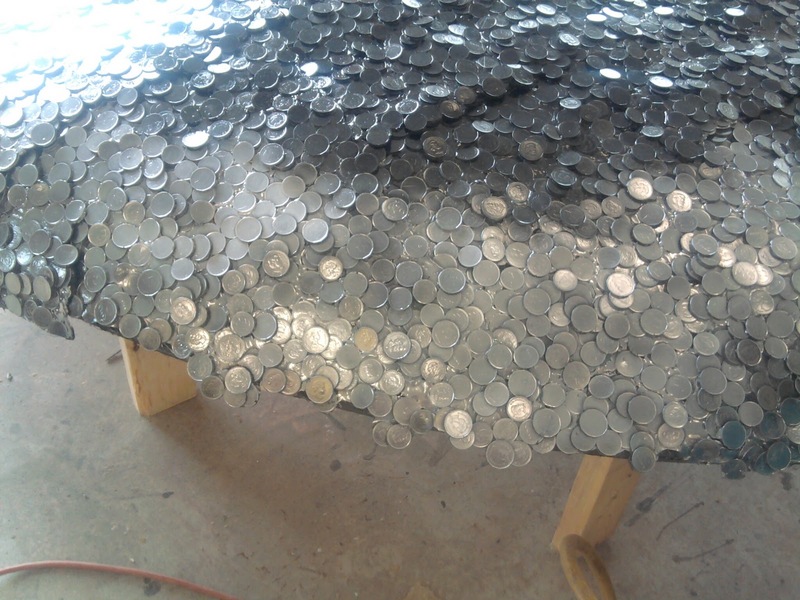 We will use around 20 large sheets totaling a real coin total of $4655.00 worth of quarters and dollar coins!!! 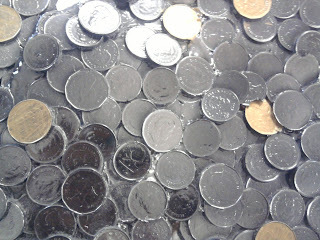 Sometimes our jobs can let us make HUGE PILES of money!!! Quite literally! 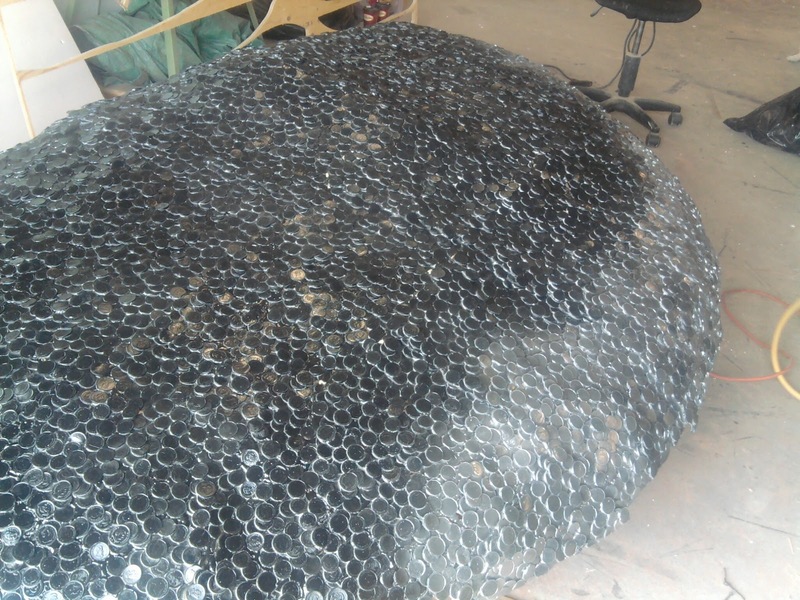 We got a call on Friday from a repeat client who needs a mound of coins. And they need it Thursday. 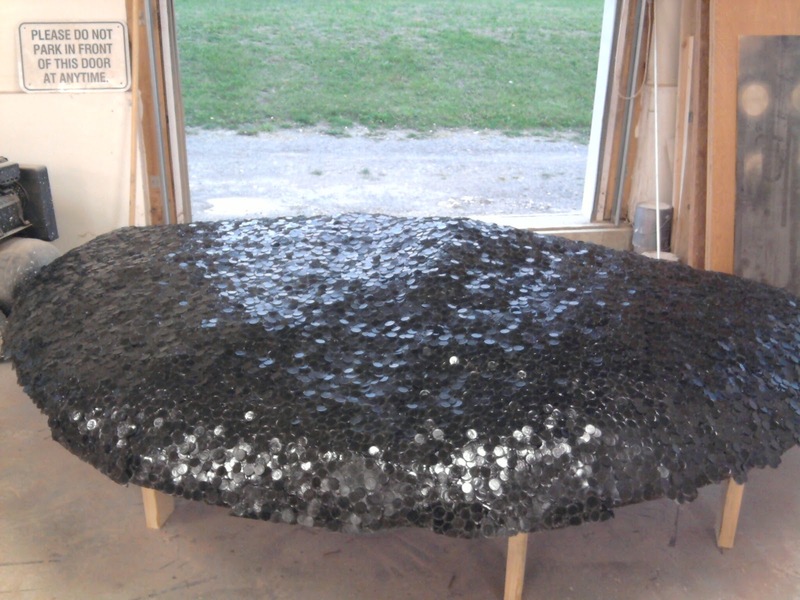 This mound will be comped into a fountain scene. It's a fairly big mound of money, We will only be building half the pile, as the other have will never be seen because it's a still shot. The pile is going to be around 10 feet wide, 5 feet deep and around 12-16" high. 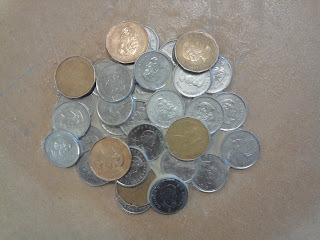 I went to the shop today with my giant change jar from my dresser and got started. They want 75% quarters and approx. 25% dollar coins. So my plan for the money portion was to create a small section of money piled up, fill all the undercuts with clay, and make a mold of this. 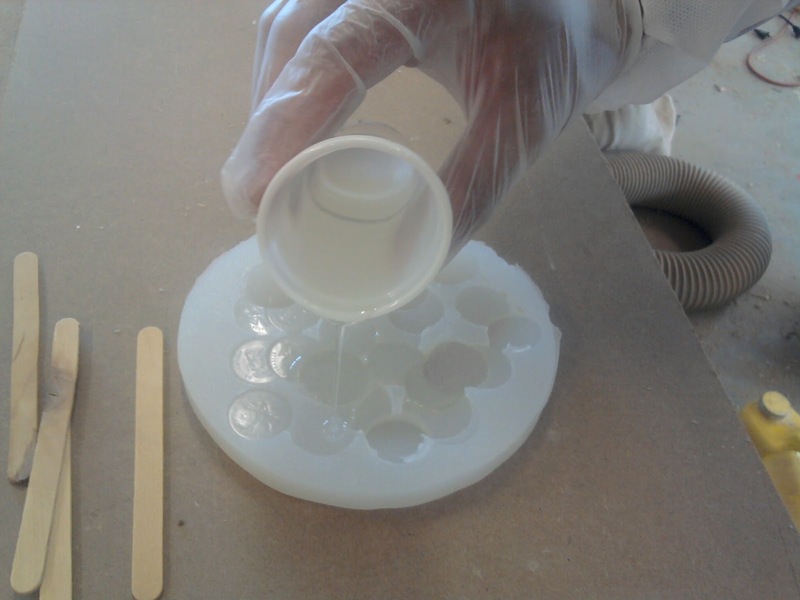 As the silicone rubber takes around 24 hours to cure, we needed to get started right away. 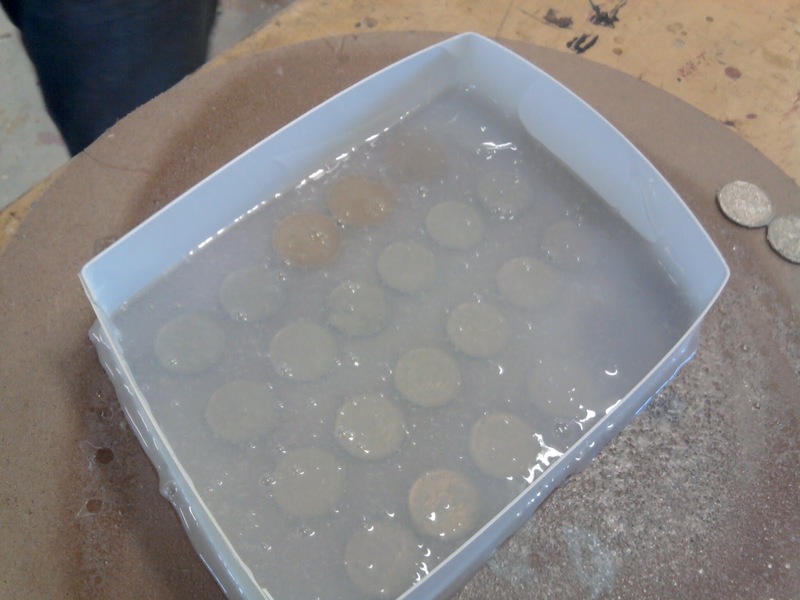 Once the mold for this smaller pile is ready, we will cast about 10-15 pulls, and then attach all those together. Then we will make a big rubber mold of the new pile made from the smaller piles. 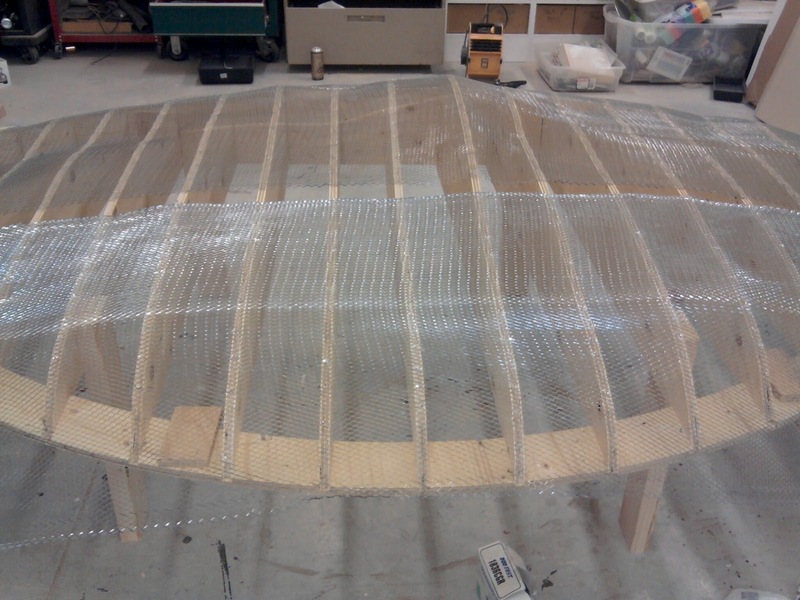 The mound structure will be made from plywood frames covered in lathe wire. 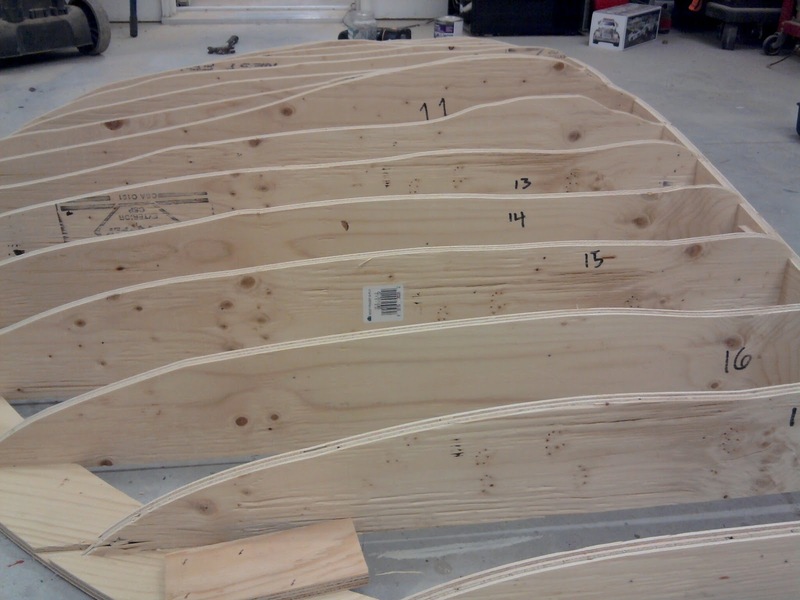 Once we start casting the bigger sheets, we will glue these to the lathe. 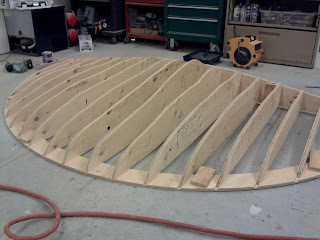 The plan is to have these frames come apart in sections for delivery. we will then join them up at the studio and run the plumbing for the fountain water. The job isn't overly complicated, the timings very tight though, especially when your at the mercy of drying paint and curing rubber. Heres the pile awaiting the mold walls. Simple walls are done and sealed for the rubber. 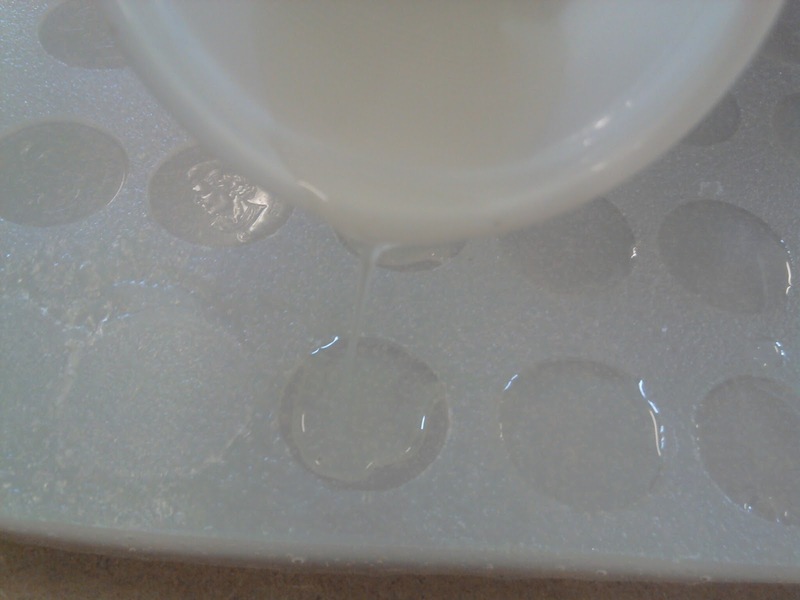 Pouring the rubber after mixing forever. 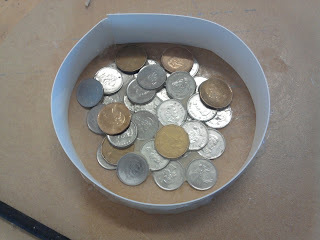 We also made a mold of individual coins in case we need them. We hosed a board down with spray adhesive so the rubber wouldn't creep under the coin making removal of the mold easier. Tomorrow I will build and cast the larger mold. As the casting resin is quite pricey, and has a limited shelf life after opening, we keep minimum amounts at the shop. We won't be able to get our 10 gallons of it until Monday, which fits the mold making timeline quite well. Farewell dear Louie, we will miss you so. On Tuesday I finished the miniature rotary engine for Louie's plane. Being that it's all PVC plastic, I think the fuel economy might be pretty good. However, I may need to beef up the cooling system! The other part of this equation is the propeller. 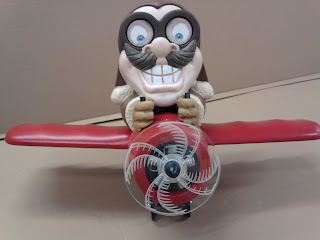 Being that Louie will be displayed hanging in the air, I didn't want the static, fixed propeller look. I decided that I would back engrave a disk of acrylic so it would have some life to it. We also got heavy into the painting of Louie himself. Using several layers of glazes and texture. Finally today he all came together like a well oiled machine. When I was doing the files for the fuselage, I put in 1/2" locating holes for the wing supports. The wings will have 2 rods and a neodymium magnet, this will allow the wings to come off for shipping, but require no fasteners for when he arrives at his destination. 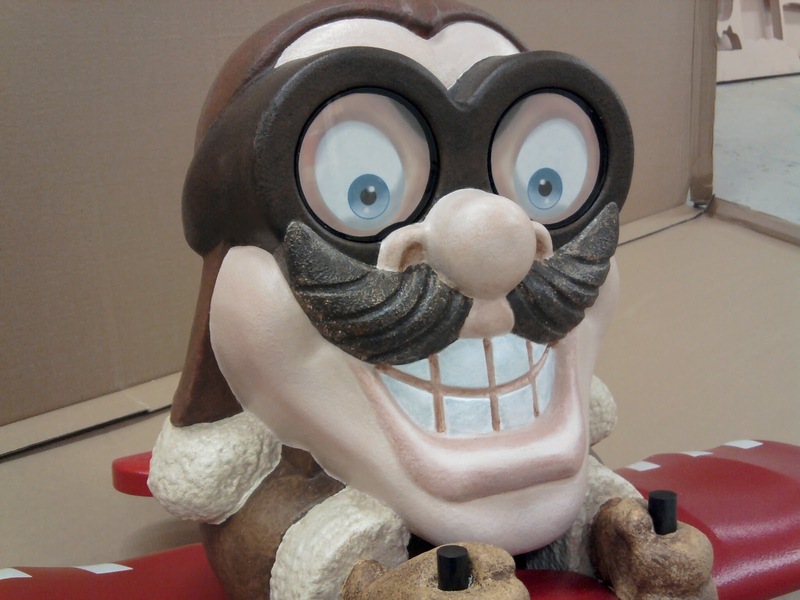 Goodbye sweet, sweet Louie, maybe we will meet again. 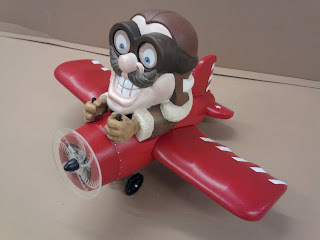 Fly safe my good friend, fly safe. 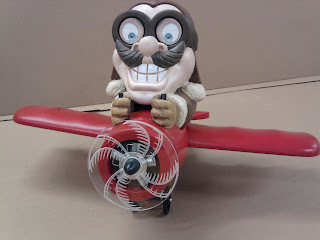 Sunday saw the final machining of all the HDU on Louie and his plane. This whole model was split in Aspire and cut from 2" material. The hands I modeled at 2" as well, knowing about the material thickness I was ordering. I decided that I didn't want to slice the hands for undercuts, but machine them as 1 piece each. 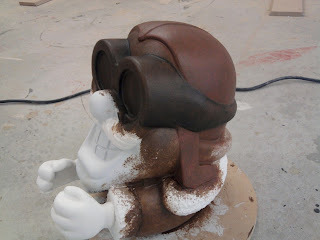 This was a job for Cut 3D. 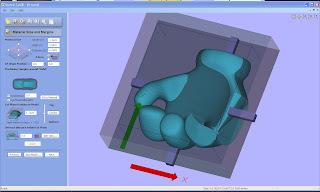 If you aren't familiar with this software, it is made by Vectric, the same company that developed our Aspire software. Cut 3d is an extremely fast toolpathing software that allows up to 4 sides of a model to be machined. 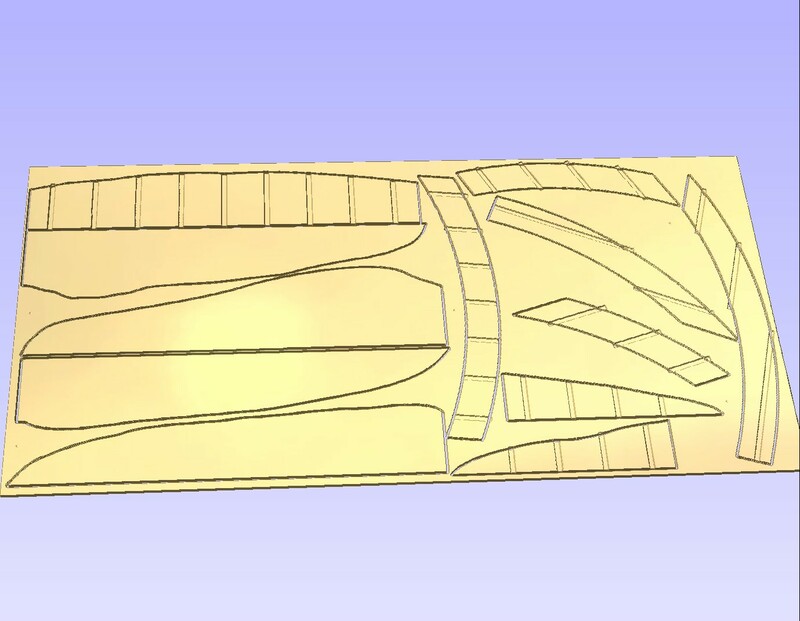 Aspire will certainly do this, but I find that Cut 3d makes the process so quick, and I can preview all machined sides in one model. It also allows for quick setup of the tabs. 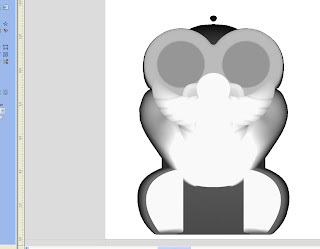 You can see the four tabs that I added to the part, as well as the material block, in the picture. 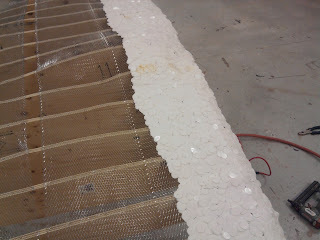 Tabs are used to hold the model to the block so it doesn't move or fall out when the cutter is making the part. I bought this software last year when we were making a bunch of chair molds for Disney Cruise Lines. It's very affordable software, so the job payed for the software after the first chair. 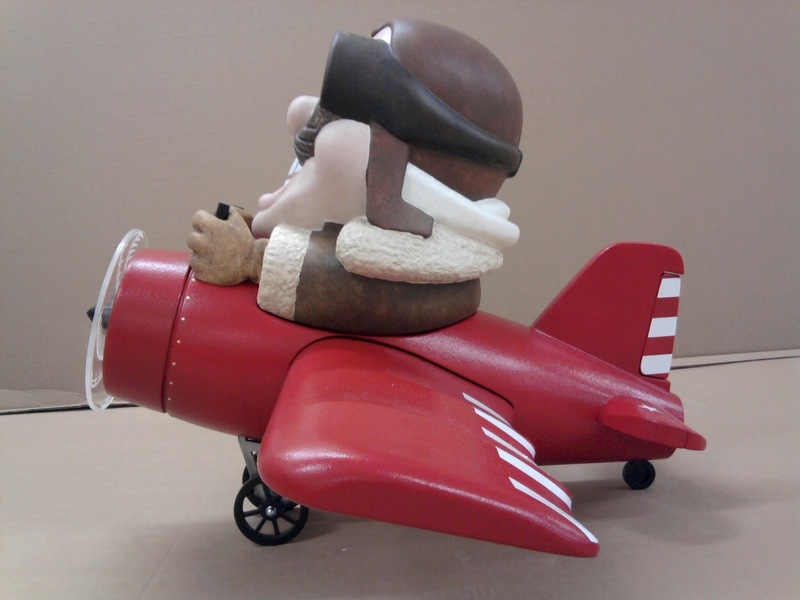 Monday I got all the parts primed and the plane parts painted red. One of the other things I decided to do was draw and print the eyes. Because I wanted his goggles to have clear acrylic lenses, it just made sense to print the eyes. 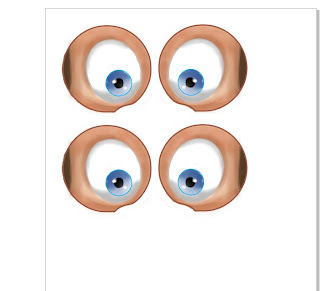 I will apply these graphics behind the lenses. In order to get the cut vectors for the lenses, I took the face model in Aspire and traced the bitmap from the 2d viewport. 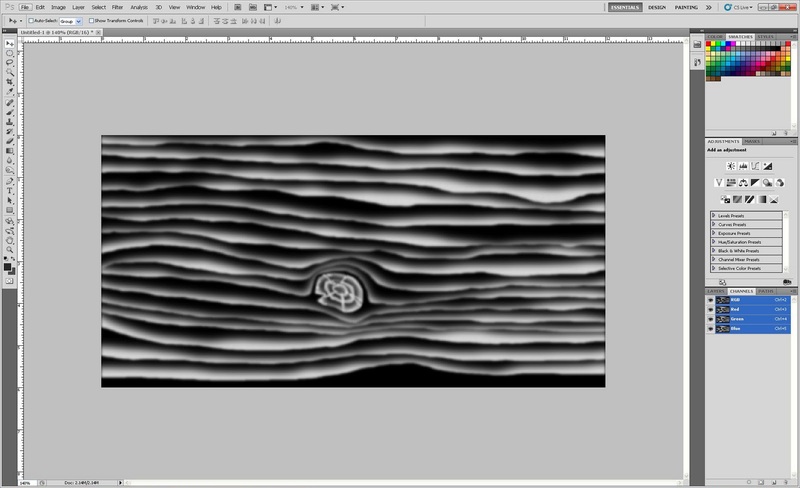 If you move the slider under the threshold setting, it basically moves the "cut plane" from the top of the model to the bottom in small layers. Once the threshold was around where the lenses would be on the model, I selected the 'fit vectors to bitmap' and this gave me the vectors for the inside opening of the goggle eye holes. I exported the vectors for the lenses into our drawing software, as well as the packaging box artwork, and a pic of the actual toy. 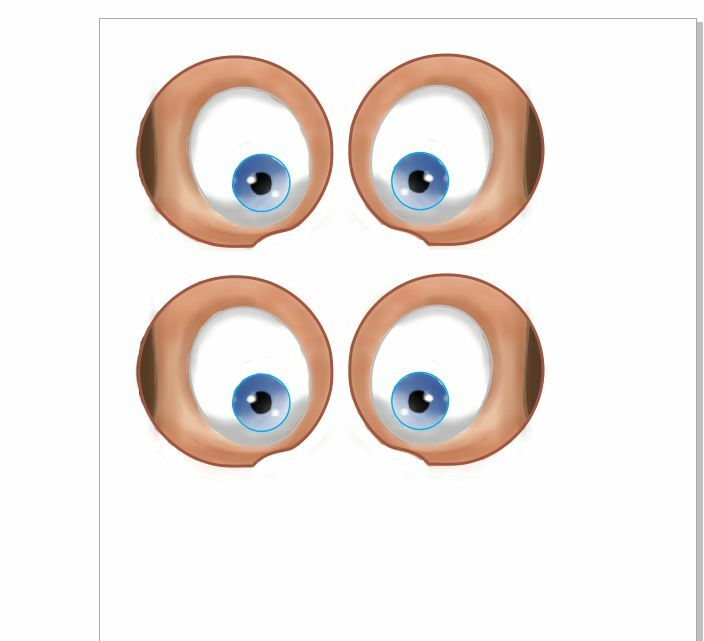 I used the vectors as guidelines for drawing the new eyes that I will print. The eyes are very in-keeping with the box art. 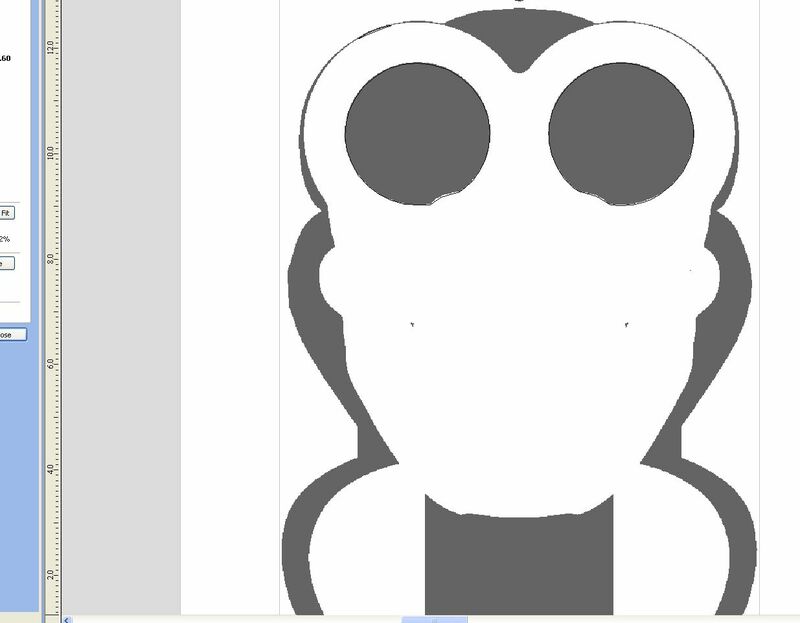 And as I drew it with using the vectors as a guideline, when I print them out, they will be at the exact size. I was also able to get a whole pile of painting done today, but left my camera at the shop, so no updated pictures today. There will be a whole pile of catch-up pictures tomorrow however, so tomorrow might be more of a visual blog than text! Starting at 8 am just to get a head!